volunteers | Friends of Paint Lick,Inc. 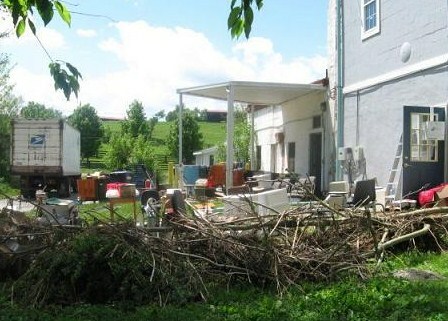 A week of cleanup in Paint Lick. After two days of steady rain, water was running in the streets of Pain Lick. This was the scene about 5:00pm Sunday and sometime between 8:00 and 9:00, a sudden surge of the creek sent it over the bridge and into the buildings. With varying degrees of water, the bank had the worse, the Friends building, the Paint Lick Clinic, the Post office, and other building all suffered water and mud damage inside. Don Webber’s wood-working gallery perhaps suffered the worse structural damage. First light of day Monday, saw crews of workers, many volunteers, assessing the damage and beginning the clean-up. Not visable here, are the damaged ac units. The estimate for the Friends is $1,350 to replace shorted compressors, etc. Over at the bank, a professional cleaning unit was called in after workers had moved out furniture and money. The water was even in the vault so patrons with security deposit boxes were advised to come down and see if their contents needed attention. At the clinic, everything including files and supplies had to be removed and sent for sterilizing. 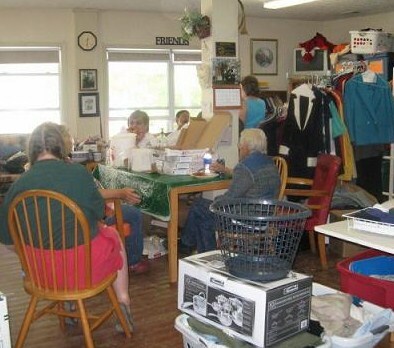 Thanks to some faithful workers, Friends was able to clean the front room and get things back to order in time to be the place for workers in all the other places to come for lunch break. Clean-up workers pause at Friends for Pizza break. Loretta Adams from the County Extension office brought pizza and drinks, and Janet brought hot soup to allow workers to have a lunch break w/o leaving the Village. 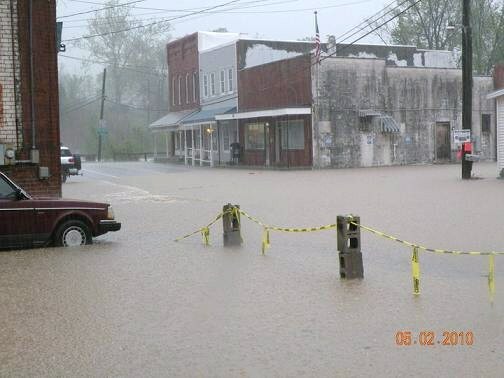 Madison County reported some 8 inches total and other serious flooding. Our old timers said that in the last 50 years they had never seen water in the buildings like this flood brought. We are very grateful for sunny days following the flood and for the army of workers who are putting things back together. In the springtime, they can be breath-taking! A short distance from Paint Lick are some foothills affectionately known as “the knobs”. For anyone raised in this area, they kind of make the place special like the “Pinnacles” south of Berea. This is the hill where Katie (Rollins)spends her time. 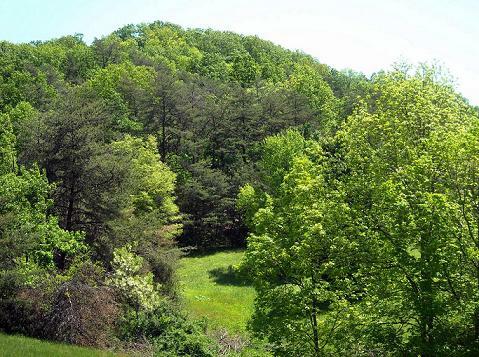 It is appropriately named Halcomb’s Knob and is located off Old Wallacetown Road in Paint Lick. Most mornings, the view totally escapes any description. Katie is caregiver for an elderly, yet very spry and genteel lady, Esther, who says she’s “like the purple woman in the Bible”. The flowers you see are among the many that dot the knob along with a natural animal habitat and forestry so tall one can not imagine the depth. 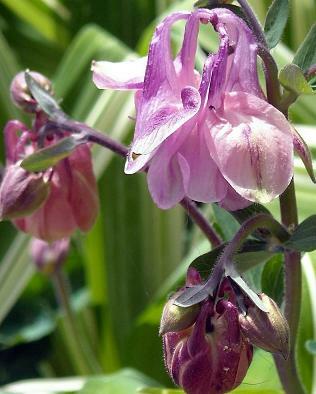 The mayapple is Katie’s very favorite although the spring beauties come in as a close second. The wild geraniums and wild creeping phlox are a wonder! If you take a notion to see something so magnificent, it will take your breath away…. then contact Katie here at Friends…. Don Weber is a Paint Lick treasure in every sense of that word. He has helped us here at Friends so often that we need to give him his official volunteer badge. What many of you may not know is that Don comes from another culture and I know he must get homesick now and then. For Don, I have put up this video in, a wonderful traditional Welsh hymn . And for the rest of you who have never encountered this rich people and their heritage let this be a wake-up call. I imagine that not a few of the original Kentucky pioneers were Welch transplants. Thinking of you Don this Lenten season. Thank you for the richness that you and your lovely wife Beth bring to our lives and community. Visit Don’s woodwright-shop. Right here in the Village.